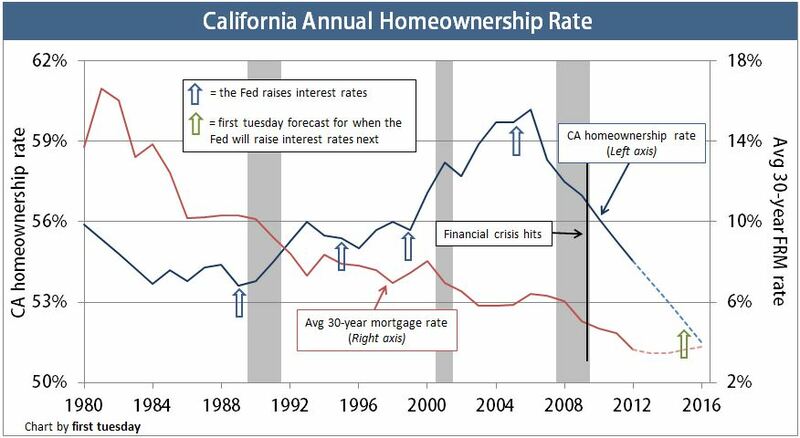 California’s homeownership rate ballooned during the Millennium Boom, but is now free falling. At what point will California’s homeownership rate stabilize, and what factors will contribute to future increases and decreases? California’s homeownership rate continued to decrease in the second quarter (Q2) of 2013. Today’s homeownership rate is 54%. This is down from 54.7% one year earlier. Homeownership was at its highest in 2006, at 60.7%. Since then, it has quickly decreased. California homeownership will likely drop to 51% by 2017 and remain at that level for about a decade as interest rates rise. 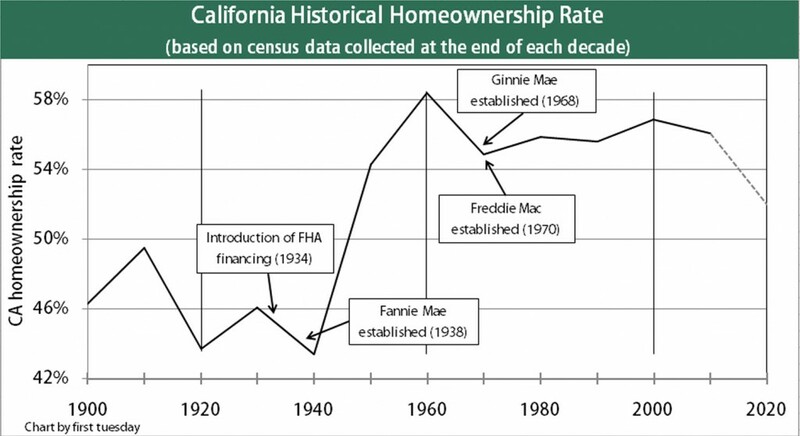 California’s homeownership rate is historically around 10 percentage points below the national homeownership rate (at 65% as of Q2 2013). This is due to a combination of factors; including the lesser impact the national policy of pushing the “American Dream” of homeownership has had on more mobile, free-spirited Californians. 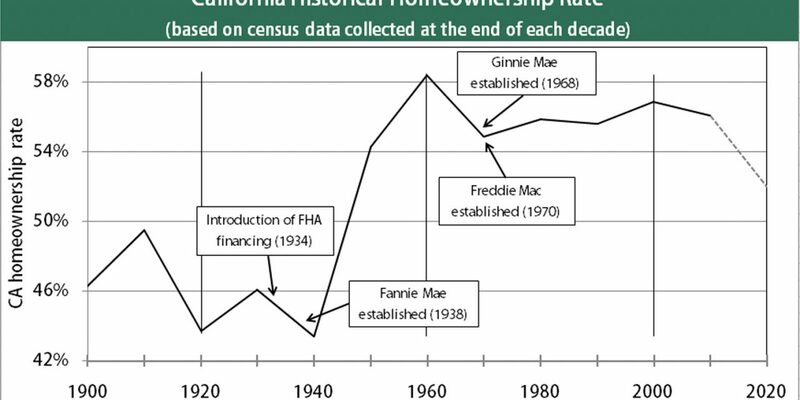 While social events springing from the Great Depression and WWII had a strong effect on these numbers, the introduction of Federal Housing Administration (FHA)-insured financing in 1934 was a supporting influence, part of a developing push towards homeownership as a national housing policy. The FHA allowed virtually anyone with a steady income to finance the purchase of a home. Prior to FHA financing, only individuals wealthy enough to qualify with steep 50% downpayments had the opportunity to own a home. Sellers frequently supplied the financing without which they could not sell. In a non-recession market, homeownership rates drop as interest rates move upward to cool the economy, as reflected in the rate of homeownership during the late 1950s through the early 1980s. Chart 2 displays the generally unacknowledged converse relationship between the average 30-year mortgage rate and the homeownership rate (and home price trends) from early 1980 until 2006, at the beginning of the current Lesser Depression. However, due to our Lesser Depression brought on by the financial crisis, after 2007 both mortgage and homeownership rates have dropped in tandem. Today, the homeownership rate is still stabilizing, a correction of the effects of irresponsible lending during the Millennium Boom (not the fault of FHA or Frannie, but Wall Street bond market independence). Further, the Federal Reserve (the Fed)’s third round of quantitative easing (QE3) will attempt to coax homebuyers out of the woodwork (since Congress has failed to do so) by lowering mortgage rates by continuing to supply money to mortgage lenders at literally zero interest. However, by 2016 the 30-year mortgage rate will again begin to rise, as it did in the ‘60s and ‘70s, and with that move, the homeownership rate will continue to lose strength before it fully stabilizes. For the next 25 years or so, and in reverse of the direction taken during the past 30 years, interest rates will rise and this will inhibit homeownership – as occurred in the 1960-1980 period. The Fed intentionally raises short-term interest rates to deliberately induce a business recession when the economy is over performing. The effects usually take hold in two to three years. More precisely, the recession sets in around 12 months after short-term rates rise above long-term rates. Just as the recession’s magic was removing inefficiencies in the economy, fiscal and monetary moves post-9/11 led directly to the Millennium Boom. In the boom, as aided and abetted by financial deregulation, low-tier home prices were artificially driven to a three-fold high. A new real estate paradigm was prematurely declared in which prices would go up and up forever, in defiance of economic principles. Bond rating agencies, properly induced by Wall Street Bankers, fully endorsed the concept. Of course, this false paradigm came crashing down in 2007, and we have been in recession and recovery mode ever since, the Lesser Depression. The next time the Fed will likely raise interest rates will be in 2015, once the Fed deems QE3 has accomplished its goal of stabilizing the economy, and the housing market has regained its past vigor (but not past prices). Looking forward on another plain, the homeownership rate will stabilize when California’s employment level reaches its 2007 pre-recession peak. The job market’s recovery progress has stalled as of June 2013, adding only 236,000 jobs over the past 12 months, a meager increase of 1.6%. In order to provide sufficient fuel for the California housing market to make a solid, upward recovery, a minimum of 350,000 jobs must be added on a year-over-year basis for 18-24 months. We have not yet arrived at that tipping point. first tuesday forecasts this job growth level to come about in 2014-2015, with jobs returning to the December 2007 peak in 2016. It will take a further 30 months to reach the percentage of California’s population employed in 2007, since we will experience a nearly 10% population increase from 2007 through 2016. This factor will boost residential construction. Finally, the quantities of short sales, trustee’s sales and bankruptcies, for so long as they remain abnormally high, will continue to affect the homeownership rate adversely. 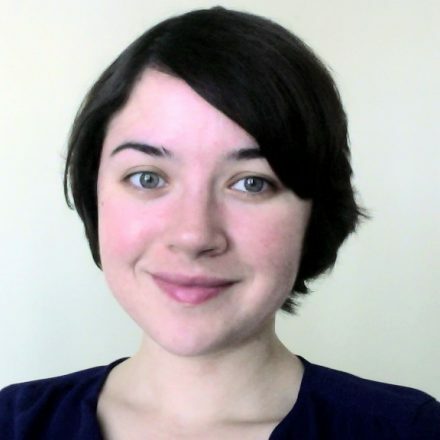 The reduction of demand by removal of these displaced homeowners is the culprit, not property pricing and mortgage rates which cannot fully offset the headwinds of past homeownership destroyed. 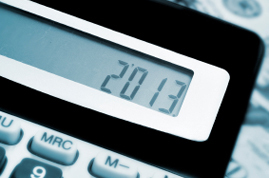 The number of trustee’s sales has decreased since 2010. 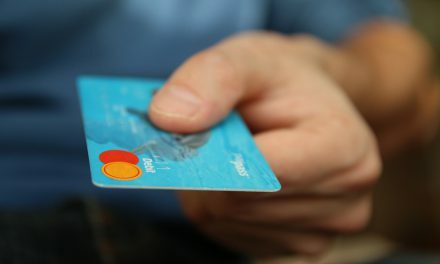 In reciprocation, the number of short sales has increased, accounting for 18% of all California resale activity in the second quarter of 2012, up slightly from 17% one year prior. As short sales and foreclosures collectively continue at an elevated rate, properties hitting the market are more likely to be held by lenders or gathered by speculators and buy-to-let investors. The homeownership rate will continue to decrease as displaced homeowners involuntarily revert to renting. Personal bankruptcies, which spiked during the recession, have dropped slightly since then. Historical evidence displays a jump in bankruptcies and homeowner strategic default just before the conclusion of a recovery, which has yet to arrive. 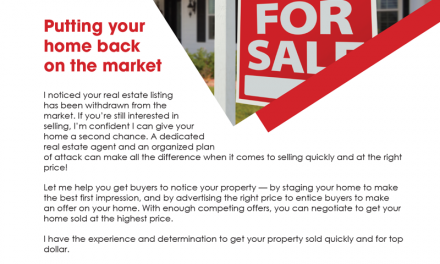 It is at this time of improved confidence that homeowners will walk away to start anew, finally realizing their underwater homes will not soon emerge into positive equity territory. Expect to see bankruptcies and strategic defaults increase at the tail end of the current recovery, probably around 2016 into 2017. So where can California’s brokers and agents look for a boost in homeownership rates once again? Help will certainly not come from any government stimulus (such as a tax dodge or refreshed national housing policy) beyond the Fed efforts. 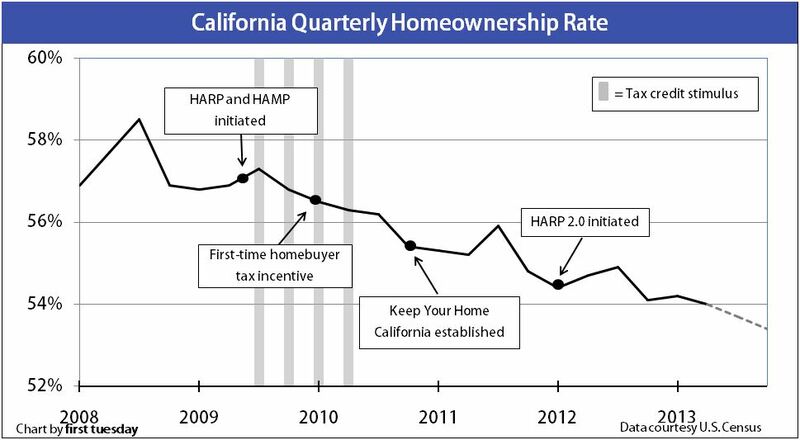 Chart 3 clearly shows the 2009 tax credit stimulus did nothing to improve California’s homeownership rate. (It did do what the politicians sought – to reduce builder and lender inventories, but at the cost of reduced future sales). Rather, jobs will be the decisive factor, as it takes a reliable source of income to qualify a potential homebuyer. Thank you very much for this excellent article .